Source: U.S. Energy Information Administration, Annual Energy Outlook 2012 Early Release. Over the next 25 years, natural gas and renewable fuels gain a larger share of the United States generating mix of electricity, according Annual Energy Outlook 2012 (AEO2012) Early Release Reference case. Coal remains the dominant source of electricity, but its share drops from 45% in 2010 to 39% in 2035. These results are from the AEO2012 Reference case, which assumes no changes in current laws and regulations. The full report will include additional cases measuring the impacts of alternative policies and different paths for prices and technologies on the electric power sector. 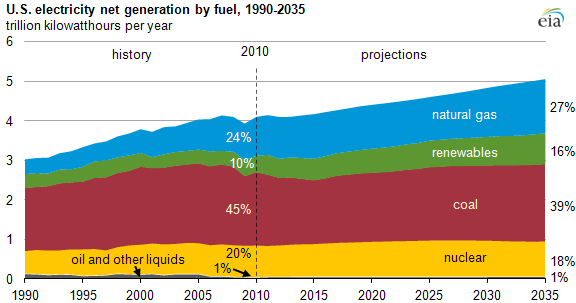 Annual generation from natural gas increases by 39% from 2010 to 2035. Eighty-five gigawatts of new gas capacity is added through 2035, as stable capital costs and low fuel prices make it the most attractive source of new capacity. Renewable energy generation grows 33% from 2010 to 2035. Non-hydro renewables account for a majority of this growth, with wind, solar, biomass, and geothermal generation all significantly larger at the end of the projection horizon. Coal's share of the electricity generation mix drops from 45% to 39% between 2010 and 2035. Thirty-three gigawatts of coal capacity are retired and only 14 gigawatts of new coal capacity already under construction are completed. A few factors disadvantage the relative economics of coal-fired capacity: projected low natural gas prices, the continued rise of new coal-fired plants' construction costs, and concerns over potential greenhouse gas emissions policies. Annual generation from nuclear power plants grows by 11% from 2010 to 2035, but its share of the generation mix declines. A total of 10 gigawatts of new nuclear capacity are projected through 2035, as well as an increase of 7 gigawatts achieved from uprates to existing nuclear units. About 6 gigawatts of existing nuclear capacity are retired, primarily in the last few years of the projection.